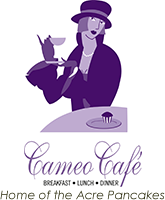 At Cameo Café of Vancouver, Washington, we provide you with everything from appetizing breakfast food items to delectable dinner entrees prepared by staff with more than 25 years of experience. Our clients love the exciting flavors and variety present in our menu, often coming back to try something different every time. We use local ingredients, such as our pure beef and bacon, to create these tasty options. You can also enjoy carefully crafted cocktails and seasonal beers from our full bar to pair with your meal while relaxing on our outdoor patio. See our full menu here. For a truly unique dish, try our Eggs Jerusalem, which features two poached steaks on top of a grilled English muffin, topped with artichoke, olives, and mushrooms. Don't forget to try some of our signature strong bread either! It's a preservative-free exceptional blend of grains, honey, buttermilk, poppy seed, and polenta, which bakes into a wonderfully delicious side to any meal. You can even take some home, just like our baby hot sauce bottles. Every day from 4:30 p.m. to 7:30 p.m. is our happy hour, a time when you can try our delicious food and alcohol selection at a special, relaxing-after-work price. We offer a full bar, with seasonal and regular beer options. We carry both locally brewed brands, as well as domestics and imports such as Budweiser™, Bud Light™, Blue Moon™, Heineken™, and Miller™. 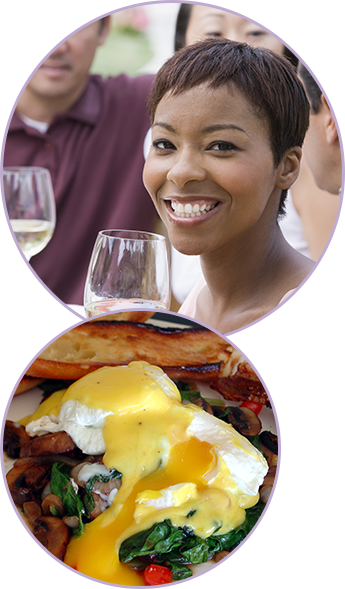 You always find the perfect dish and drink when you order from our happy hour menu.